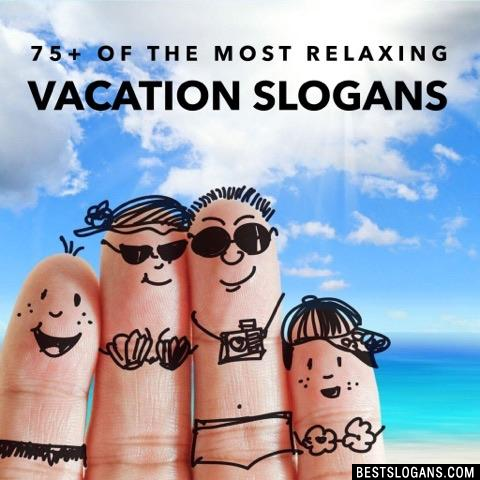 75 new entries added to vacation slogans, that include pictures. 1. Your world. Your way. 1 Your world. Your way. 2 Where family fun begins. 3 Travel with a clear conscience. 4 Theres no place like it. 5 The Land that Sings. 6 The Island for All Seasons. 7 The best way to see America! 8 Take me to the top. 9 Relax... You're with us! We make it simple. 10 Railtrips to here, there and everywhere! 12 Let your soul and spirit fly. 13 Let us show you the world! 14 Just a Smile Away. 15 Journeys as great as the destinations. 16 Journey at its luxurious best. 17 Inspiring destinations within your reach. 18 Great journeys - fascinating places. 19 Exclusive holidays for the single traveler. 20 Everything else is in the shade. Can you think of a good Vacation Slogans we're missing? Or come up with a clever one of your own. Please share below.